The background: in the late 21st century, six extrasolar planets are discovered, at the same time that faster-than-light travel is developed enabling mankind to reach them. “Initial colonies to each of them suffered high mortality rates due to accidents and sometimes harsh living conditions. While humans are highly adaptable, they were just not physically hardy enough to endure some of the conditions they faced. Years later, genetic scientists from the Terran Colonization Coalition soon began tinkering with condemned prisoners in secret and used the McEwen process to combine human DNA sequences with data from other Terran life forms, primarily canine (dogs), feline (cats), ursine (bear) and vulpine (foxes). It was their hope to improve humanity in such a way to give settling colonists an edge on their survival. With the success of genetic manipulation, the Anthro Human Colonization Program was formed, and these new races were sent to the untamed colonies of Earth in an effort to see if the changes would give them an edge on survival in the wild environments. The Canis were sent as a starter colony to planet Khepri, the Felis to Bastien, the Ursis to Diamanta, and the Vulps to Javan. If the test subjects failed, the condemned would be considered an acceptable loss, but if they succeeded in surviving, it would provide new avenues for the overgrowing human population to spread out into the stars, even if no longer completely human. The experiment is successful, and a call is publicized throughout Earth for volunteers to be transformed into Furmen to become settlers in “anthro-human starter colonies”. Twenty-five years later, Furmen have become reasonably common on Earth between their transformation and their permanent departure as extrasolar colonists on more newly-discovered worlds. Brian Barrett is one of these Furman-haters. When he kills a Feli, a humanoid mountain lion, his only chance to avoid execution for murder is to agree to become the Feli’s replacement and spend the rest of his life as an interstellar cougar colonist. Blasingame makes Barrett as sympathetic as possible. Although branded as one of the human-only religious fanatics, he actually killed for a strong personal motive: his ex-fiancée left him for a Feli lover, who was the Furman he murdered. It was months of brooding on his betrayal that caused him to develop a prejudice against all furmen. Like most humans, Barrett has had little personal experience with the Furmen. So after he agrees to accept transformation, Barrett is forced to live among Furmen while awaiting his fate. Tom stepped up to a counter and tapped a small bell to signal their arrival. The small hairs on the back of Barrett's neck stood up when something came out of a doorway behind the counter and gave them all a pleasant smile. She [Jenni] did so at the same moment that she pulled her covers back, and she immediately saw something under the sheets with her. She felt a brief instance of fear at the strands of a yellowish material before she realized what she was seeing. Unrelated to the pain of transformation, other behavioral tendencies were surfacing among the Furs. The Ursis volunteers were lethargic in the cold weather, even though they would not require a seasonal hibernation like the bears from whose DNA was harvested, but the Canis volunteers, particularly the two becoming wolves, were enjoying the chilly temperatures. Likewise, the Vulps did not mind the winter weather, but those of the Felis Wing preferred to stay indoors reclining near the fireplace. Jenni and Kristen had already made the best of the situation concerning their new claws, as it presented them with new extremities to decorate with nail polish. Jenni had covered hers with a subtle pink polish, while Kristen had used scarlet. Sunset of Furmankind is much more than a study of the volunteers’ physical changes. The novel builds a social picture of the Institute, gradually pulling back from Jon to focus on all four of the Felis Wing dorm-mates; later expanding to include all sixteen of the transformees (four each of the four species) plus the Institute’s administrative staff. The cast experience personal dramas, social bonding, deaths, and more, leading to their “graduation” as full Furmen and assignment to a new extrasolar colony. If this is Blasingame’s final novel, he has ended his literary career with a spectacular flourish, including his commission of an excellent cover painting by Ashley Leuthardt [katanimate on deviantART and Fur Affinity]. Blasingame was also an author of the Blue Horizon series, including spinoff novel and UMA nominee Hoenix; both are now available from his website. Hoenix was reviewed by Fred in 2004. 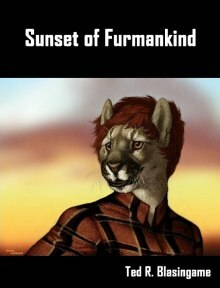 The direct sequel to Sunset of Furmankind has not yet been written, but the lengthy process of compiling my story notes has begun as a Work In Progress." So Blasingame hasn't retired from writing, after all. Yay! I really hate to say this, but if Blue Horizon is any indication of this author's writing abilities, this book is going to be poorly written and edited. Sunset of Furmankind could use tighter editing -- it is about 100 pages longer than it needs to be -- but the padding is very readable, and the extra dialogue/background/locale adds to the overall verisimitude. Blasingame's writing has improved noticeably since his Blue Horizon days.